It was an interview given to PLA Daily about one and half years ago. But most of his arguments are still valid. Jaishankar who has been India’s ambassador to China since August 2009, said “trust, a balanced economic relationship and better communication and cultural understanding” could boost bilateral ties. He further noted that the relations probably moved about 20 points up in the last one decade. In fact, about 60% of the total agreements between India and PRC were reached during the last one decade. Yet, why have the relations failed to get a better score? “Because, if we don’t make efforts, we really cannot fully exploit our convergences on many big issues of the day. We would do well to remember that the decline of India and China in the 18th-19th century was connected. 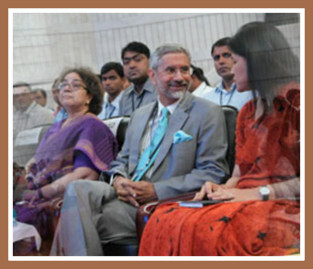 So too were their re-emergence as modern states after the Second World War…”, Jaishankar said. Jaishankar, a 1977 batch IFS officer is a contender for the next foreign secretary’s job, as incumbent Ranjan Mathai is due to retire at the end of July. Sujatha Singh, who is now India’s ambassador to Germany and who is senior to Jaishankar, is however the top contender for the coveted post. a) The Central deputation tenure of Aloke Prasad, a 1984 batch UP cadre IPS and Chief Vigilance Officer in the National Highways Authority of India (NHAI) has been extended for a period of two years beyond June 20, 2013.
b) Sudhir Mittal, a 1978 batch Punjab cadre IAS and secretary in the department of fertilizers, has been given additional charge of post of secretary, department of chemicals and petro-chemicals from May 15, 2013 to June 2, 2013 during the absence of leave of lndrajit Pal, a 1977 batch Andhra Pradesh cadre IAS. c) Rajeev Chawla, a 1987 batch Karnataka cadre IAS, presently in the cadre, has been appointed as joint secretary in the department of higher education.